With numerous antique family heirlooms but also a flair for all things modern, one family found a happy medium by mixing in transitional pieces with bold, daring style. When Liz Pharo and her husband, Andrew, stumbled upon what is now their Crestline home, Liz immediately knew that with a few renovations it would be the right fit for their recently expanded family. 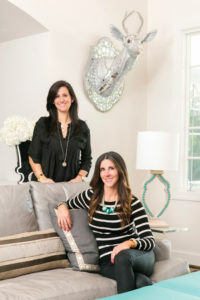 Craving color—but not willing to part with treasured family heirlooms—Liz sought help from Annie Goldberg and Ginny Maguire of AG Designs for a whole-home transformation that resulted in a fun but functional dwelling to reflect Liz’s bold style. Liz wanted the option of using the den as a family room, so Annie and Ginny kept the atmosphere fun instead of formal with a wall of eclectic artwork that Liz and Andrew had collected over the years. 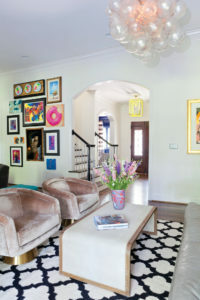 The collection features a number of unique pieces, including a velvet Elvis portrait Andrew purchased at a yard sale years ago, a giant pink donut indicating the family’s love of The Simpsons television show, and a Widespread Panic painting by Frenchy that the couple received as a wedding present. “Our artwork collection is so ridiculous that it’s actually quite endearing, ” Liz says with a laugh. The original layout included a galley kitchen, but Liz had her hopes set on an island. To make room, a wall was moved back (taking some footage from the oversized den) allowing for extra kitchen space. To create a clean, sophisticated look, Annie and Ginny chose black cabinets and Olympia white marble countertops and backsplash. Small uses of color were brought in with the red chairs and a hand-blown red Murano glass chandelier. 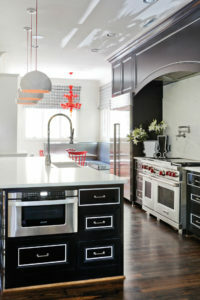 Notice the red cords on the pendant lighting. The banquette, covered in a textured silver vinyl will withstand the wear and tear of the couple’s four children. Annie and Ginny chose to make a strong statement in the formal living room with a navy lacquer wall covering. “Since this is a room they aren’t in every day, we felt we could go really bold, ” Ginny explains. The crown molding was painted a matching shade of navy to make it an extension of the wall and accentuate the ceiling height. Annie and Ginny treated the stand-alone powder bath as an opportunity to add drama with walls and ceiling covered in a black-and-white-stripe wallpaper. Since one wall of the bathroom includes a tub/shower combination, the designers had a shower curtain custom-made with black-and-white stripes of the same width as the wallpaper to act as an extension of the wall covering. “We wanted to create a feeling of the stripes just wrapping around you from every angle, ” Annie says. The designers finished up the look with a brass frame mirror and then mimicked its bubbles with the drum shade on the light fixture. To make the master bedroom serene and inviting, Annie and Ginny kept the palette mainly neutral with pale walls, an ivory upholstered headboard, and shades of gray in the rug and draperies. The calm colors let the bright emerald-green bedding grab the eye’s attention. Since the dining room would contain many of Liz’s family heirlooms—the china cabinet, chairs, and chest of drawers were all gifts from her father—Annie and Ginny knew the room would need something to help lighten up the look of so much dark furniture. To do so, they kept the walls neutral and reupholstered the chairs in an ivory fabric. 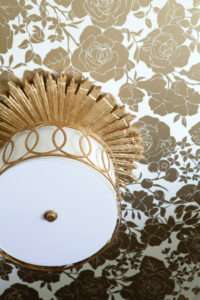 They also covered the ceiling with a hand-painted silver-leaf wallpaper. “It’s a subtle feature, but one that really creates some drama, ” says Annie. To give the room the appeal of a den/study, Annie and Ginny kept the feel masculine with a stained wood veneer wall covering, wooden wall art, and dark draperies and upholstery. A U-shaped sectional sofa offers plenty of comfortable space for reading or watching television. The elegant design of the master bedroom carries into the master closet with a gold floral ceiling and gold sunburst light fixture.